Studio Apartments close to the beach. Unusual, climatic apartment on the first floor of the building next to the Vistula River. Great place to start a walk across the Bernatka Father's footbridge to Kazimierz and the Main square. An ideal place for couples, solo travelers, groups of friends and families. In the apartment feel the atmosphere of Krakow because of the well- preserved and restored walls of the building. If you're visiting with a larger group, please contact us. Two adjacent apartments can accommodate a total of 8 people. 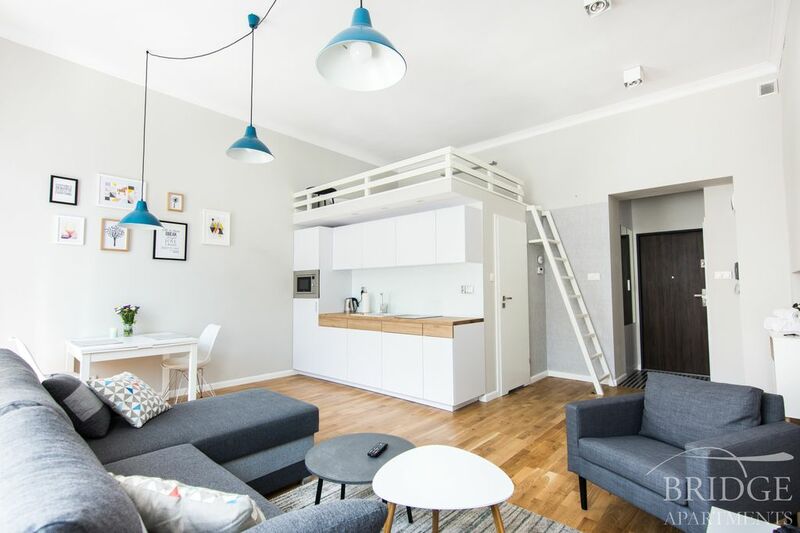 Freshly renovated and modernly furnished apartment is located in a historic, 100-year-old house and has 2 front windows overlooking the street and the Jozef Pilsudski bridge. It consists of a spacious living room, a kitchenette, a small bedroom and bathroom. The whole has about 50 m2. The lounge is equipped with a flat-screen TV and ps3 console with pads, move and games. At the entrance to the apartment is expanding wardrobe with space for shoes, bags, jackets. The living room has a sofa bed, 70-year-old Italian chest of drawers, armchair, coffee table, two stools. The kitchen is equipped with a refrigerator, two-burner electric cooker and microwave. In the lockers you will find the necessary kitchenware and utensils to prepare and eat a meal. For guests we have prepared tea and coffee. Also clean towels and crisp, cotton sheets waiting for you. Fresh bed sheets pillows and pillow cases. A kitchen contains a fridge/freezer, hob, microwave, sink, cutlery and dishes. Console PS3 with games, films and music. The apartment was decorated so so nice and the price was very cheap. Adam even booked us Taxi’s for the airport and back and also our trip to Auschwitz! The apartment was a half an hour walk to the centre which was very easy just straight walking, loved it thank you so much!